I made a fully turned lamp using steel and cherry wood as a Christmas present for my sister and brother-in-law. I got the cherry wood as 2 sections of trunk about 4 years ago from my tree-surgeon house-mate. He cut them down from a tree on Colebrook Row in Islington, London. After letting them season as planks for 3 years, this is the first time I’ve used any of them. For the design I wanted a tall thin lamp and to use a large round bulb. To make it sturdy and resistant to being knocked over, the base is solid steel and weighs a number of kilos, but the stem and connector cup are both hollow with thin wall sections. It is made from 3 sections that screw together with the cord going up through the middle. I designed the bottom of the base to have a cover plate that can be used to mount the lamp on any wall or ceiling. The stem has a steel pipe as the core inside the cherry, so it is very rigid. The bulb holder had an earth connection and all the metal parts are touching one another, so the whole lamp is earthed as well, so I guess it would pass a PAT test. It was fun to make it and I would be up for making more, but it does takes a real long time to finish them. I had to turn the rough saw log between centres as I had no other way to mount it. I turned one end down so it was cylindrical and I could mount it in the chuck. From that point I could drill it out. Luckily I had an extra long drill to do this. I glued the steel tube into the wood using expanding polyurethane glue, or gorilla glue. With the tube core glued in place, I could turn the wooden outer down to size. Then I turned the holder sleeve down to size. Next I drilled it out. Then bored it to fit the bulb holder. This is it after I parted it off. I had to make a mandrel that I would superglue the part on to machine the other end. Once on the mandrel, I turned the taper and drilled and threaded the stem end. Once in the lathe I could turn the diameter and face the bottom. Then I drilled it out before all the boring work. I cut a foot ring for the base and put a large chamfer for the cord to travel up through the centre hole. The base cap has a male M60 X 1mm thread. I cut the thread then this was used for a mandrel for turning the other side. I turned the taper with the compound. This took hours! When I finished, I drilled out the top end . Then I could check that the stem would screw into the base. Here is the base cap just before I part it off. I drilled 2 holes in the base cap to fix it to a wall or ceiling. Here it is screwed into the base. Showing the underside of the base, with the cover in place. This shows the cover taken off. The lamp can be mounted vertically, hanging down. The base can be simply screwed into a wall. Then the lamp is screwed in place. For the summer festivals, me and my friend Sarah Cockings wanted to make an art piece to take along with us. 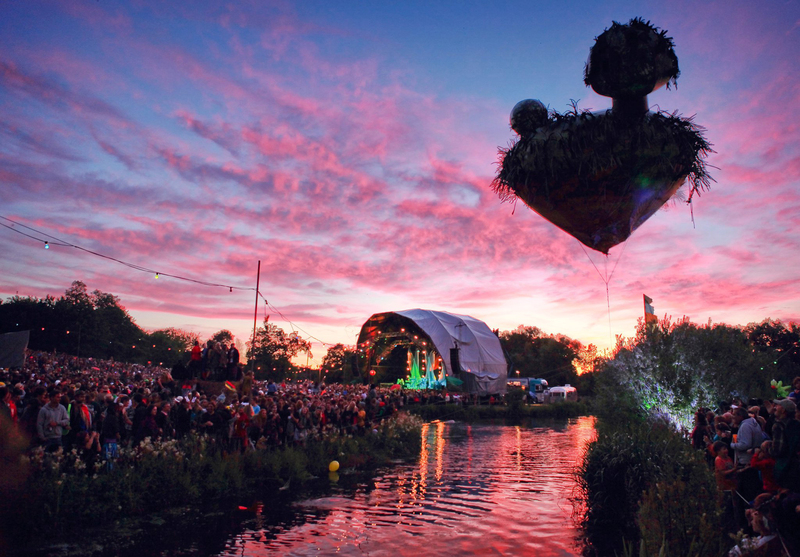 The idea of Is Land, a floating island sculpture was born. 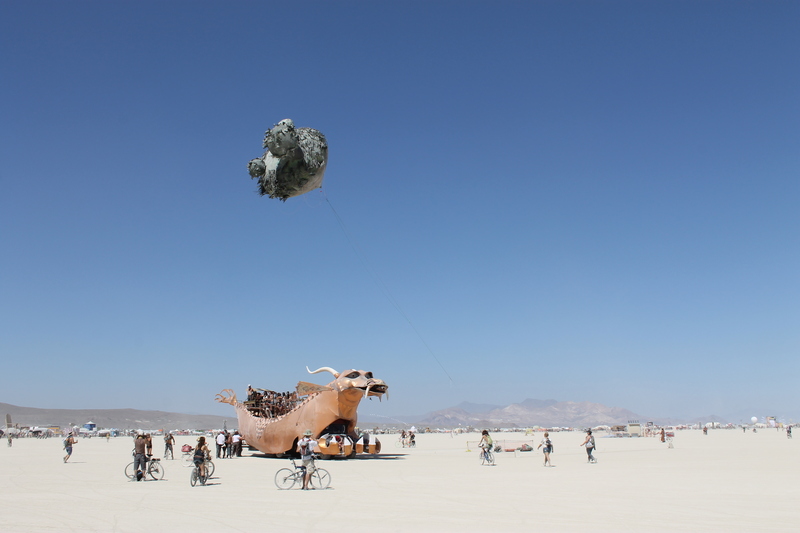 We submitted a proposal to Burning Man festival in the USA and to Secret Garden Party, here in the UK, and managed to get some funding money to make our idea become a reality. 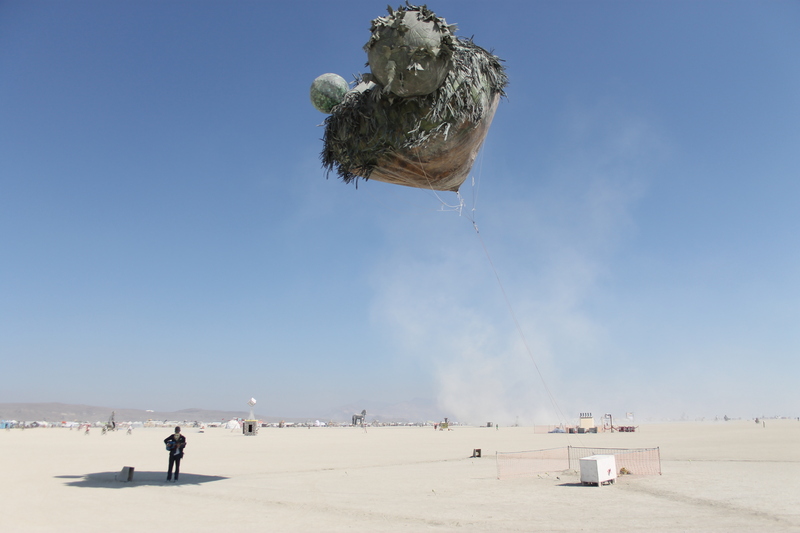 We wanted to create a sculpture that was somehow seen to be floating up in the sky, yet at the same time looked as realistic as possible. 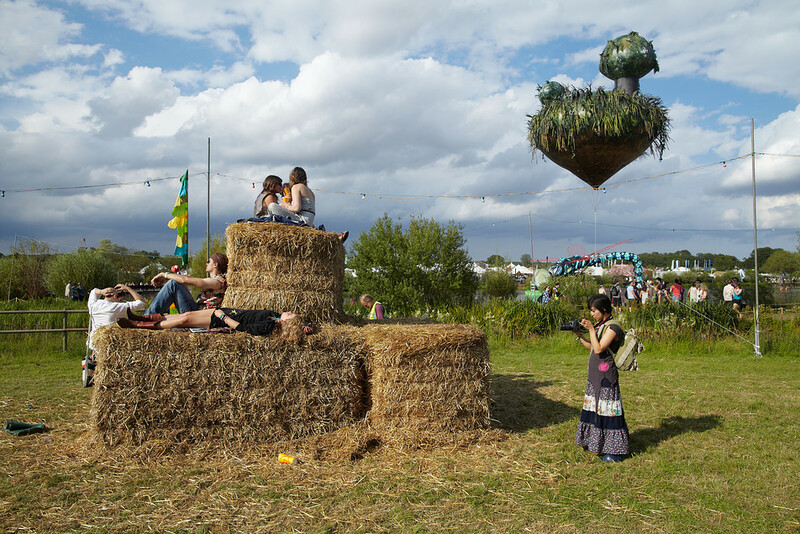 We toyed with various ideas including making a sort of polystyrene/paper mache sculpture that perches on top of a pole, as well as an air inflated structure. In the end we decided that a helium filled ballon with decoration on the outside would be the best and would have the least visual connection to the surrounding ground. We got the balloon made by Cameron balloons. We opted for a shape that looked vaguely plant-like but that still retained strength to attach decorations to and that didn’t make the cost spiral out of control. 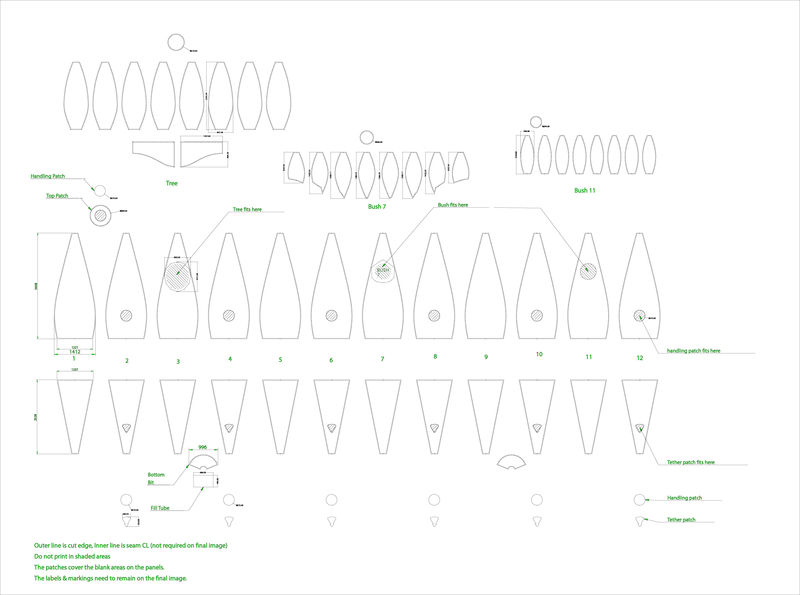 Above is an image of the panel shapes that were stitched together to create the full size balloon. 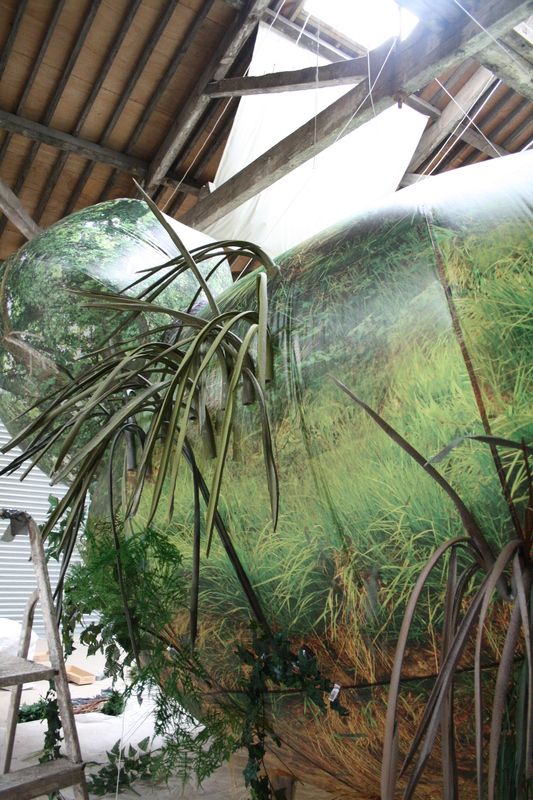 These panels were all digitally printed with images of plant foliage. 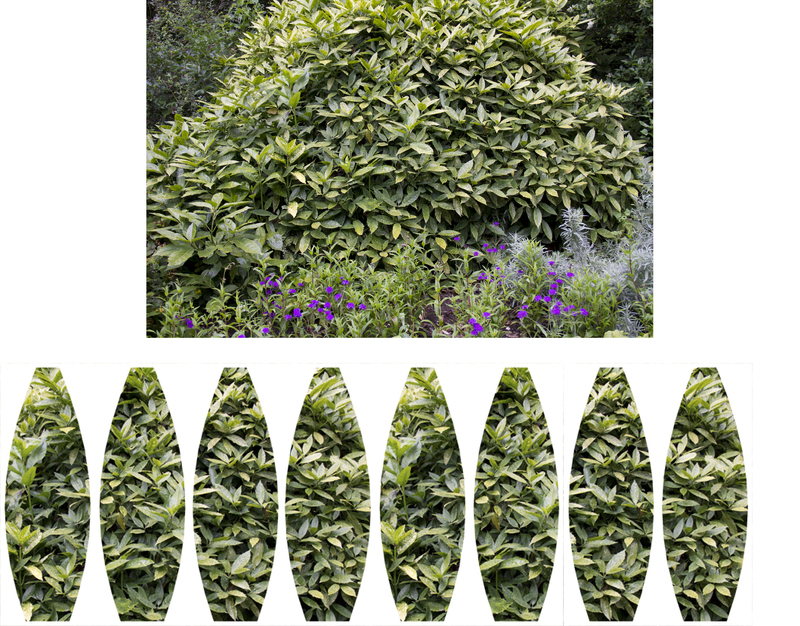 below is an image of a photo of a bush that was used for the panels, along with the panel shaped photos. 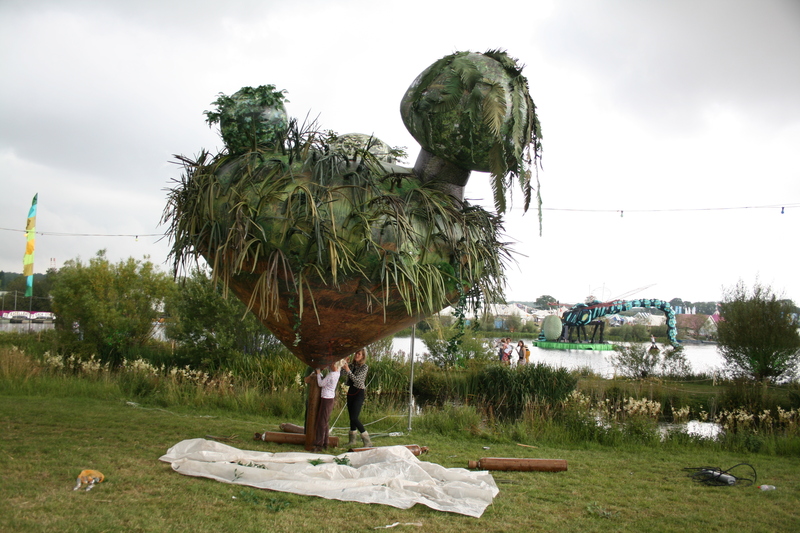 Once the balloon had been made, we were ready to decorate it in preparation for Secret Garden Party. The main issue with the decoration was the weight. The balloon was roughly 47m3. As a rule of thumb, helium can lift 1kg per m3, and our balloon material and tethering weight about 19kg. This gave us 28kg to potentially play around with, but it is advisable to have at between 1/3 and 1/2 of the total lift of the volum of helium still lifting the balloon, so as to keep it pulling upwards even when there are strong gusts of wind. This left us with about 13kgs for decorating, including the decorating material, the paint and the glue. We bought 200 2m lengths from local building supplies. This meant clearing out 3 suppliers. We then cut them into halves and thirds and started to shred them, so they had a sort of dracaena or yukka look to them. 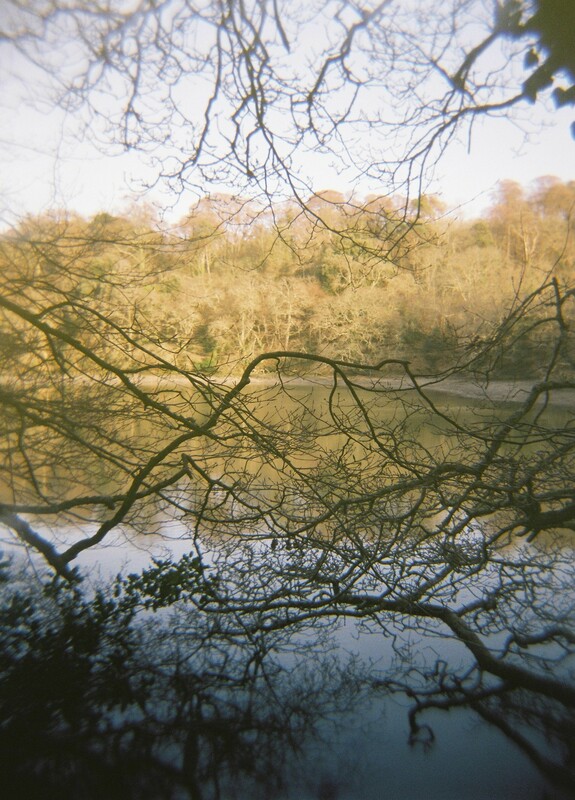 They were painted greens and some shades of brown. To help the contact adhesive soak into the foam, a patch was cut from the surface of the foam, where there seemed to be a non-porous layer. Some of the areas were on the side of the foam tube, and some were glued end-on. For these, another section of tube was attached to provide more support to anchor to the balloon. 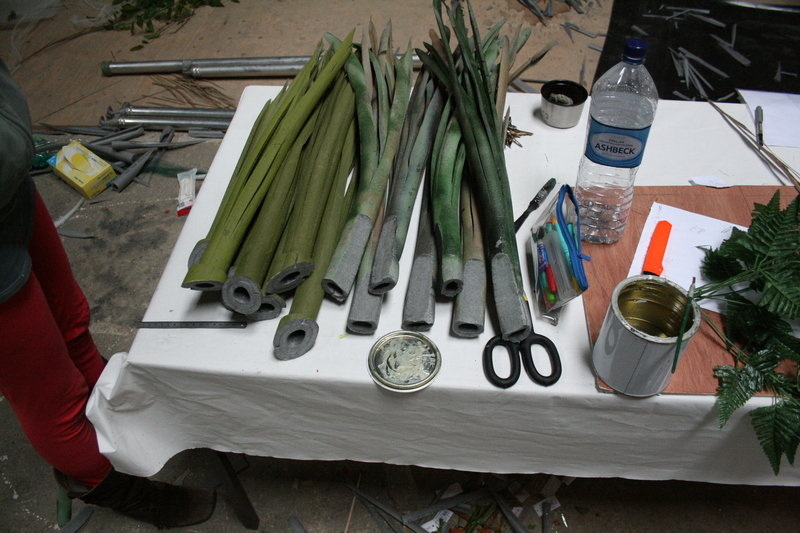 As well as using these painted foam fronds, we attached some pieces of plastic foliage that you can buy for decoration. These looked really good, but unfortunately were relatively a lot more expensive and normally had a metal wire core so weighed too much to use in large numbers. We decorated the 2 bushes and some of the tree mainly with the artificial foliage. After collapsing it down and squashing it into a transit van, we got it to the festival site and started filling it with helium. Once it was filled with helium, we had to squeeze it underneath a powerline and above some water. Cue monkey and canoe antics. We did manage to get it up OK. We had it tethered to the banks of the pond using Nylon rope at 4 points. We used 1m lengths of rebar bent in half, and hammered into the bank. 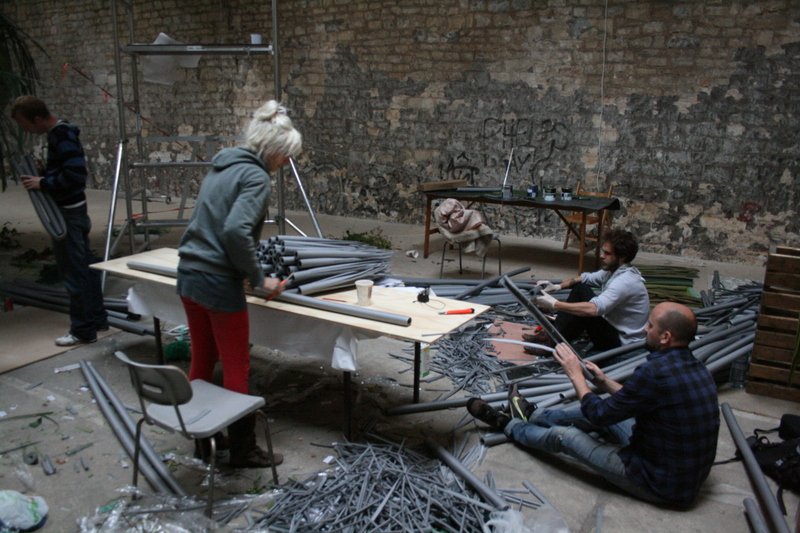 For a couple of days, everything went perfectly, and the sculpture was enjoyed by everyone, then….. disaster! 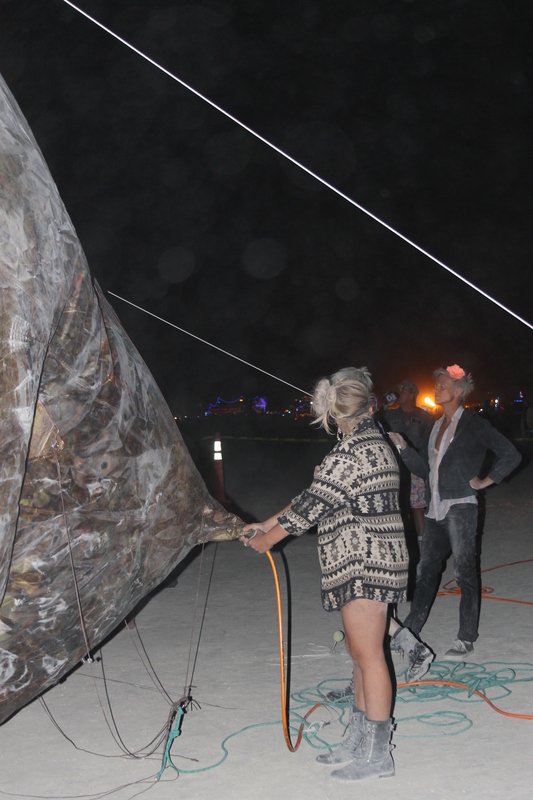 On Saturday night/Sunday morning, some vandals managed to cut the rope tethers, allowing the balloon to float away into the atmosphere. At the time this was a major nightmare, but in time it turned out to be a bit of a blessing. The story got picked up by a load of national newspapers including The Times, The Guardian, The Observer and The Telegraph. 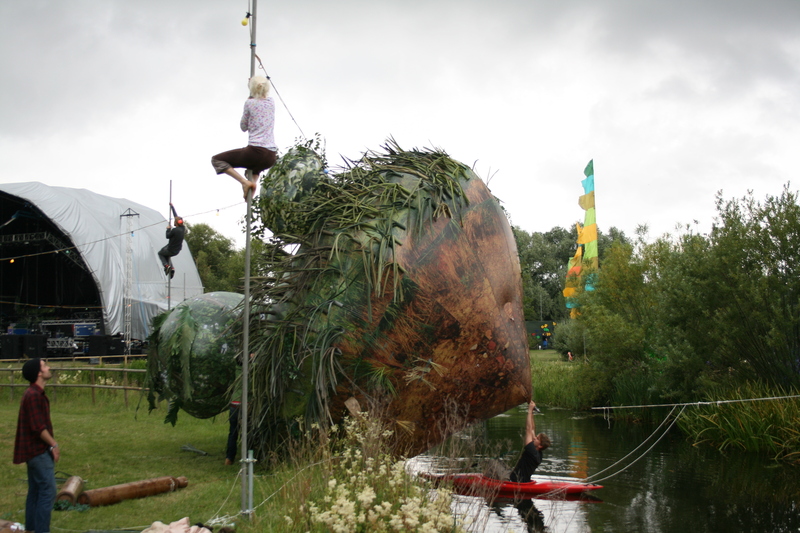 Thanks to this exposure, we managed to get some funding from Secret Garden Party to remake the sculpture in time for Burning Man festival. We flew out to LA, where we stayed for a week or so to try and organise everything for burning man. Because we were on regular tourist visas, we had the balloon shipped out seperately to try and avoid any customs complications. We completely failed at this aim. We spent 3 days non stop driving accross LA between various shipping company offices and the airport to get our packaged out of customs, where it was being held on a technicality, while trying to deal with the time difference with the UK. All this because the package had been sent with the wrong information from the UK. If I have any advice, it would be make sure you speak on the phone to the shipping agents at both the sending and recieving to make sure everything is understood by everyone. 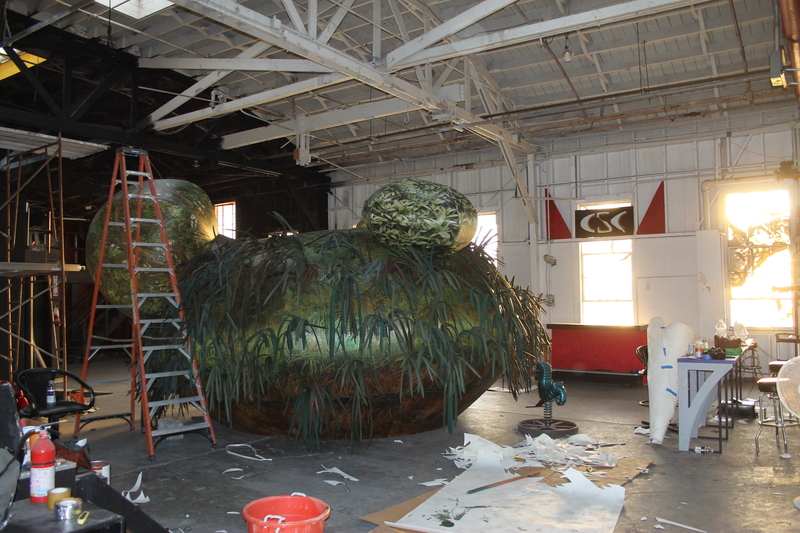 Once we had the balloon, we had to find a space to use to decorate it and we found the Big Arts Lab in downtown LA. I’d highly recommend this space if anyone is in LA. We got into the space to start decorating it. 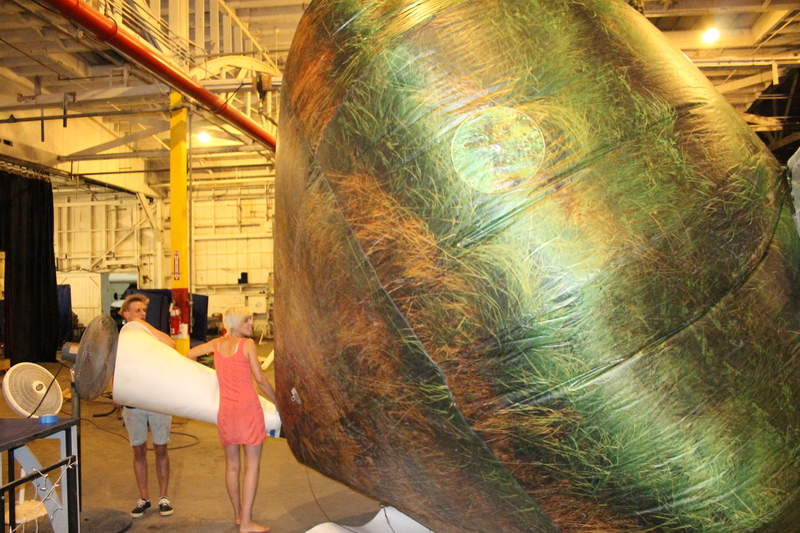 We found an improvised way to inflate it with 47m3 of air using a fan and rolled up funnel. After a couple of days using the same technique as before, we had it finished and ready for the desert! We had to completely provide ourselves with lighting. We rigged up 4 floodlights, running off a single generator. 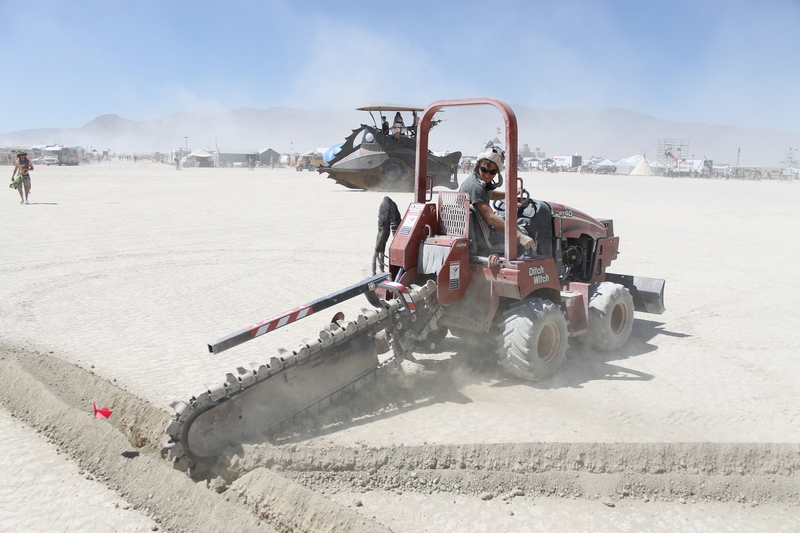 To wire them together, we got some trenches dug using this rad machine, the ditch witch. 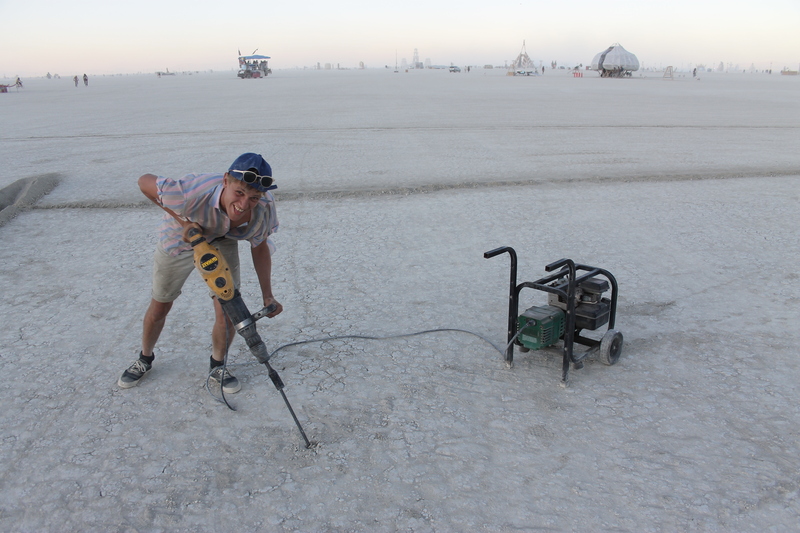 For tethering, this time round, we went for stainless steel wire rope, held in place using rebar that was hammered into the desert. We had a handy mechanical friend that made it quite quick. Once it was all set up, it was ready to inflate. We used a much better inflation system this time, with the proper piping. 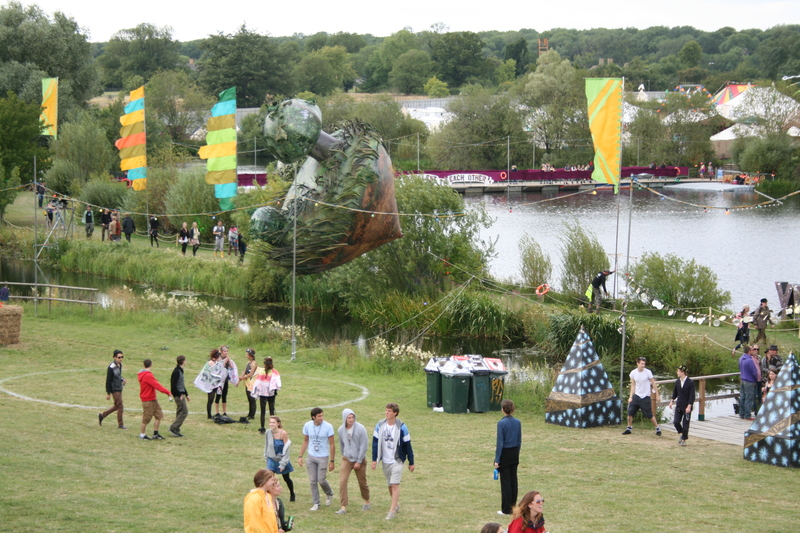 It took about 10 minutes to inflate with 6 cannisters this time round, instead of about 1:30hr at Secret Garden Party. Big thankyou to Airship Victoria for the tips and equipment they lent us. In the daytime, once it was up, it looked really nice, especially with the backdrop of the vast expanse. After having it tethered on a 5m line to start with, we decided we wanted it up further and extended it to 25m. This worked well and meant it could be seen from all corners of the festival. 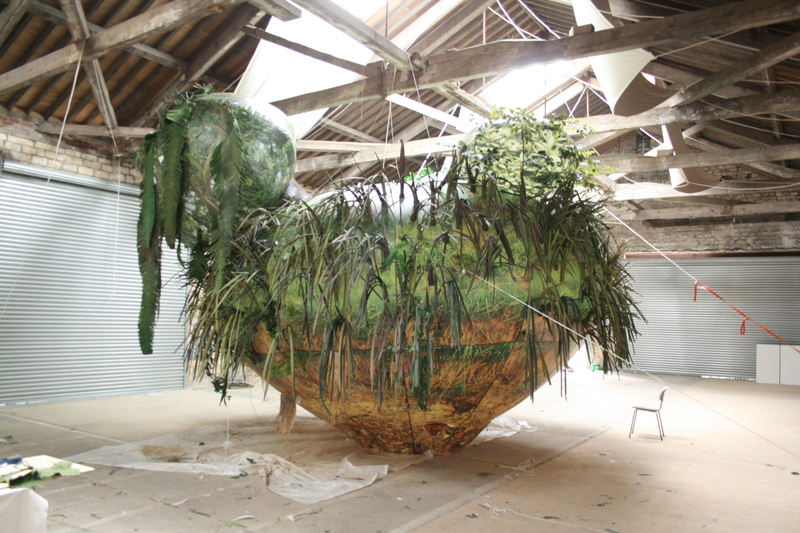 Is Land was quite a roller coaster ride of a project, with some amazing experiences along the way. There’s also the possibility of some future events with it too, that I will post about here. Feel free to contact me if you want any more information. This isn’t a post about stuf that I’ve made but it’s a link to a video for a song by a good friend of mine, Chris. I’m sure you’ll find it highly enjoyable. I thought I should start cataloging the stuff that I make as I go along so I’m starting here. I’ll put some things I’ve made recently up over the next few days.